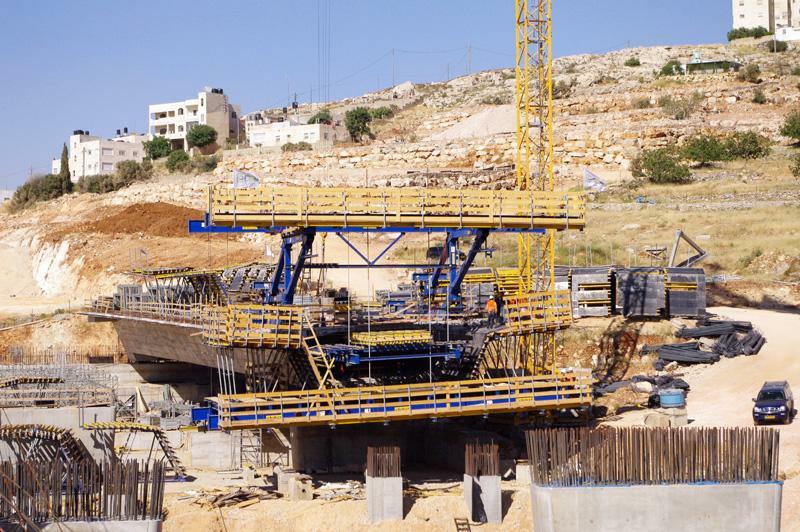 As part of the work on the new ‘Interchange 4 to 20’ motorway junction outside Israel’s capital, Jerusalem, Ramet LTD is building a new bridge over a valley. 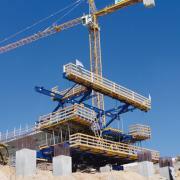 Doka has supplied this construction project with a customised all-in-one forming solution: Two Cantilever forming travellers (CFTs) have been fielded for constructing the two side-by-side bridge superstructures, while the high-capacity Load-bearing tower Staxo 100 system is being used on the piers. The greatest challenge for the Formwork Experts here is the inside deck slab: its radius of only 268 m is the smallest that Doka has ever formed with Cantilever forming travellers. Pushing geometrical boundaries to the very limit – this is the biggest challenge of the ‘2 Bridges Road 4 to 20’ project for the Doka Formwork Experts. 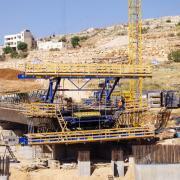 The 110 m long and 16.8 m wide motorway bridge being built for a new interchange just outside Jerusalem crosses a valley on three piers and comprises two separate superstructures. Having had very positive experience on previous projects, the Israeli construction firm Ramet LTD opted to work with Doka once again. The extensive advisory and planning services and high safety standard offered by Doka were further reasons underlying this decision. “In Doka, we have a highly experienced formwork-technology partner for our project”, notes Ramet CEO Dan Ben-Amran. The structure comprises two side-by-side bridge superstructures; the radius of the inside bridge is only 268 m. On this project, Doka is fielding two Cantilever forming travellers. Unlike in classic cantilevering-works, where the CFTs are ‘balanced’ (i.e. start from one pier-head in opposite directions), here the CFTs are ‘unbalanced’, meaning that they start from two different piers and move the two sets of bridge-deck formwork towards one another. Each bridge superstructure involves 18 casting segments, each of 5 m, and a closing cycle. To save time and to ensure rapid repositioning, the 70-tonne CFT on the middle pier is not completely dismantled: The CFT superstructure travels across the pier, while the rails of the inside traveller are run through openings provided specially for this purpose in the pier. Only the bottom grid of the CFT is lowered during the repositioning operation, before being taken by crane to its new position on the other side of the middle pier and then raised again. Another requirement dealt with by the Doka Formwork Experts is the transverse gradient of the bridge, resulting from the curve in its superstructures. As the axis of the bridge is not perpendicular, the bridge superstructure and the formwork each have different pivot points, and this means that the formwork has to be inclined. Because the cross-section of the superstructure is constant over its whole length, the entire outside formwork rests on stand-off supports on the bottom grid, with only the inside formwork being suspended from the traveller. The Doka cantilever forming travellers are also a convincing solution in terms of safety, with features such as permanent self-locking to prevent unwanted travelling, safe access to all work-deck levels via integrated ladderways, and their fully railed-in work-platforms. As well as instructing the site crew in how to handle the formwork equipment correctly, an experienced Formwork Supervisor was on hand to assist with erection of the CFTs on the pier-heads, and with the first travelling operation. This ensured safe, speedy forming operations right from the very first casting segment. The specialists in the Doka Competence Centre for Cantilever Construction planned and implemented this technically challenging project in close collaboration with Doka Israel. 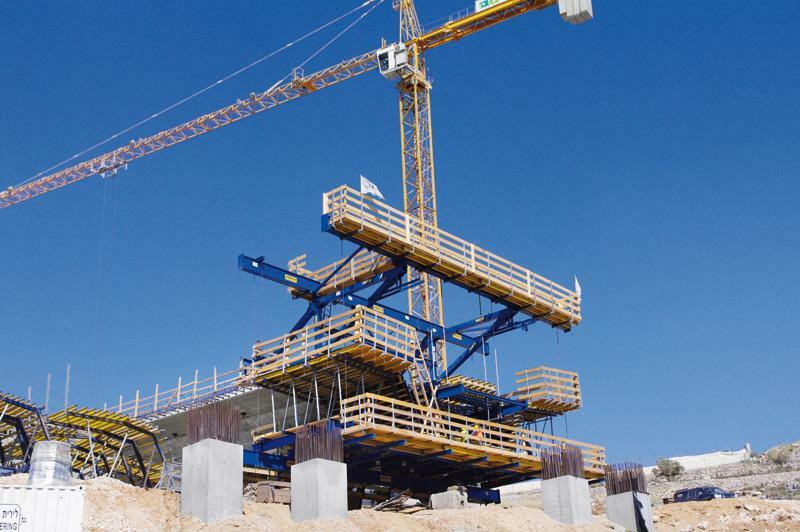 The local Doka branch supplied the high-capacity Load-bearing tower Staxo 100 system and large-area formwork Top 50 for forming and casting the bridge piers and pier-heads. “The Doka cantilever forming travellers give us fast, smooth construction progress in every phase of the work”, says a satisfied Dan Ben-Amran. Thank you for your interest - Small radius, big challenge. Thank you very much for your interest - Small radius, big challenge.